US President George W Bush has pledged to keep American troops in Iraq until "the job is complete". Speaking after a summit in Jordan with Iraqi PM Nouri Maliki, he said troops would remain as long as Mr Maliki's government wanted them there. But he said it was important to speed up training for the Iraqi security forces. 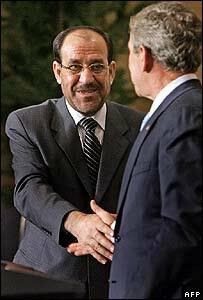 Mr Bush praised Mr Maliki as the "right guy for Iraq". The summit had been delayed by a day amid denials of a snub to Mr Bush. It was held as reports suggested a report by America's cross-party Iraq Study Group would recommend changes to US policy. It appears to recommend a pullback of US troops to their bases but no firm timetable for a pullout from Iraq. Mr Bush said the Iraqi prime minister had told him any partition of the country would only make things worse. "The prime minister made clear that splitting his country into parts... is not what the Iraqi people want and that any partition of Iraq would only lead to an increase in sectarian violence. I agree. "In the long term, security in Iraq requires reconciliation." It was important, Mr Bush continued, to speed up training for the Iraqi security forces which were "evolving from ground zero". He said that Mr Maliki should have more forces under his control, so that terrorists and death squads could be defeated. But he added that it was in US interests "to help liberty prevail in the Middle East, starting with Iraq". "And that's why this business about graceful exit simply has no realism to it at all," Mr Bush said. For his part, Mr Maliki said they agreed on the need to speed up the transfer of security responsibilities to the Iraqi forces. "I believe that the Iraqi security forces are capable enough of protecting the country and its citizens against those who seek to undermine their safety." He said he wanted to work with all law-abiding parties inside Iraq and sought a relationship of mutual respect with Iraq's neighbours. The summit followed one of the bloodiest weeks in the country since the US-led invasion in 2003. Mr Maliki was under enormous pressure at home not to meet President Bush with the political group loyal to Shia cleric Moqtada Sadr suspending its participation in the government. A leaked US memo also raised questions about Mr Maliki's ability to control sectarian violence. And the US cross-party Iraq Study Group is due to release a review of Iraq policy next week which is thought to call for a troop withdrawal and eventual talks with Syria and Iran. The BBC's world affairs correspondent, Nick Childs, notes that the central theme of the Amman summit was clearly how to give more security responsibility to the Iraqis themselves more quickly. But Mr Bush also seemed, again, to play down the prospects of direct US talks with Iran on Iraq. For his part, Mr Maliki expressed some frustration over the criticism he has received and underlined the challenges his government faces. The fact and the tone of this meeting were clear recognition that the two leaders are confronting new political pressures and a new political landscape, our correspondent says.